Ponevez Yeshiva – one of the largest Torah centers in the world – opened overseas more than 80 years ago by its founder: spiritual giant Rabbi Yosef Shlomo Kahaneman zt"l (known in the Jewish world as "The Ponevez Rabbi"). holy country when World War II broke out. With the beginning of the annihilation of European Jews by the Nazis, the Gaon Rabbi Yosef Shlomo Kahaneman fled the bloodbaths under amazing circumstances, and in Nissan 5700 (April 1940), immigrated to Eretz Israel. Here, he significantly expanded the scope of the yeshiva to the point where it became a Torah center on a global scale, and became the cornerstone and foundation of the contemporary yeshiva world – primarily in Eretz Israel but also in the Diaspora. 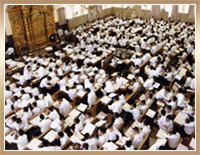 From all corners of the earth, students flock to the Ponevez Yeshiva in Bnei Brak, which has to this day, managed to graduate 20,000 – including thousands of scholars and hundreds of rabbis, head of yeshivas, educators and men of creativity and action, who wield strong influence in the life of the people of Israel wherever they may be scattered. 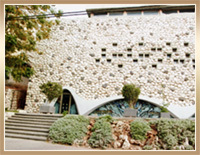 The Big Yeshiva , Bnei Brak – includes boarding schools with 3 meals a day for pupils. 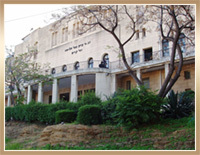 The “Bendheim” Yeshiva for Youths, Bnei Brak – including the “Pearlman Kollel”, Bnei Brak. The Kraushar “Beer Yacov” Yeshiva and Dormitories, Bnei Brak. “Kiryat Hayeled – Children's Town” and 2 "Batei-Avoth", homes for boys and girls, Bnei Brak. Special institutions for immigrant child from Russia and Bukhara, Bnei Brak. “Heder Harav” (Talmud Torah for boys), Ashdod. “Beit Yacov” Elementary and High Schools for Girls, Ashdod. “Yeshiva Ketana”- "Dumas Wilkomir, Ashdod. "Yarchei Kallah" for Talmudic studies during vacations – for them and their families on vacation and recovery time. A Torah library with hundreds of thousands of exemplars, open to all Torah scholars as well as to the general public. Institute to publish the Torah innovations of The Pearlman Kollel, and the rabbis. Institute of Lithuanian Jewry Life, to commemorate the spiritual life of the Jewish community in Lithuania, which was destroyed in the Holocaust.